An outdoor classroom for all occasions – a Shakespearian globe, an ‘in-between space’ and much more. Springhead Primary School is a successful Community School in Stoke on Trent for 3 to 11 year olds. It typically outperforms other schools both regionally and nationally in developing their students from Key Stage 1 to Key Stage 2 in Reading (96%), Writing (100%) and Maths (100%). To support this ethos and provide much needed space the school began to look at new outdoor building options in early 2014. We looked at conventional wooden buildings but found that we could make more use of a dome. The school was reaching the point where it needed more practical teaching space, especially to enhance their work with the Royal Shakespeare Company outreach programme, the Learning and Performance Network (LPN). The LPN aims to bring significant change to the way young people experience and engage with the work of Shakespeare. With its large open plan, circular area, the school decided that a SOLARDOME® Sanctuary would best support the group work and LPN activities they run. Mr Anderson commented that the build went very smoothly. 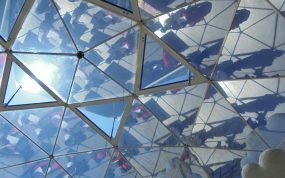 Solardome provided documentation, support and advice on what was required for the groundworks, and when the team came to build the dome it was completed without disruption. 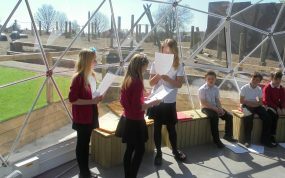 The dome is ideal for outdoor learning too. On windy days it’s a great ‘in-between’ space where the children can return to complete their work without going back to the classroom – it maintains that feeling of being outside. 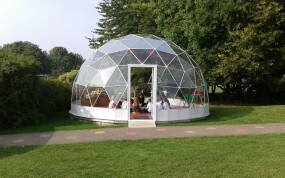 The school are also using their dome at playtime and dinner times. Children are encouraged to use the dome to play in, and the real advantage to the school is that this space can be used without additional supervision as the duty playground staff can see inside. When it’s rainy or snowy, Mr Anderson remarks that the children queue up to lay on the floor of the dome, and look up to watch the snow or rain fall onto the glass. With a 48m² base, their SOLARDOME® Sanctuary has even catered for two classes at a time. Fitted out with benches around the edge, which double up as storage for play equipment, the dome is also equipped with a music and lighting system. It’s better than we expected. Parents, staff, everyone is impressed with it. It really does have that wow factor. The dome is a really useful and flexible asset for the school; it has so much more potential. The challenge To provide a space that provided more than just value for money, but one which inspired and could be used for multiple purposes. Following a visit to the Solardome Industries showroom, the team at Park View Infant School were inspired to purchase the SOLARDOME® Retreat as an outdoor classroom.